Larger than Redshank with long, green (sometimes yellow-green) legs, fairly long, stout, slightly upturned bill and mainly grey and white plumage. Flight action slow and jerky with rather long, uniform, dark wings contrasting with paler head and neck, and conspicuous white tail and wedge up back, similar to much smaller, slimmer and paler Marsh Sandpiper; legs protrude beyond tip of tail, but proportionally less than Marsh’s. 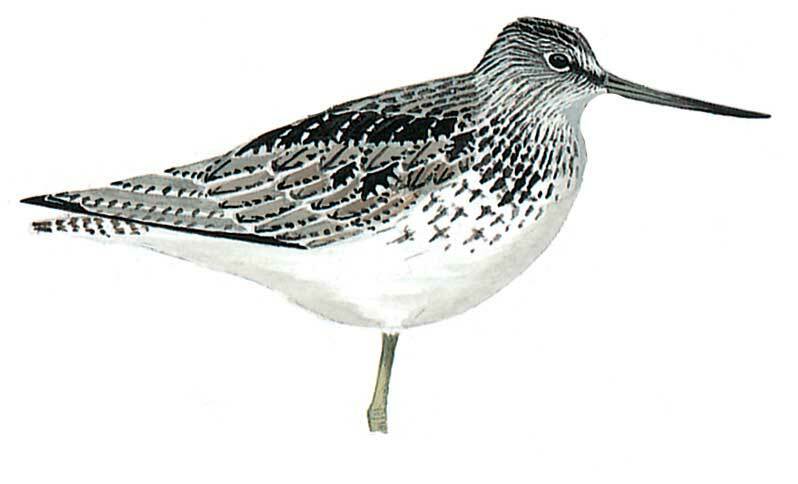 Winter plumage resembles Marsh’s, but darker grey, and darker face lacks supercilium. Summer plumage has black feather spotting on upper-parts and distinctly spotted breast and flanks. Juvenile uniformly patterned with buff-fringed grey-brown upperparts, white underparts and streaked grey head, neck and breast. Rather active, often running when feeding on small fish in shallow water.